This blog was originally published here. It is being republished with permission from our friends at Finding Balance. Are you facing eating issues? Since eating and body image issues are so pervasive these days, it can be difficult to find healthy role models to emulate. Just what IS balance anyway? Well, there are many components to it, including the way we eat, our food choices, exercise habits, thought patterns and how we view our bodies. Listed below are healthy goals to strive for in order to move in a positive direction with eating. This list isn’t all inclusive and no one is going to score 100%–it’s not about perfection. It’s about finding balance. So ask yourself, Am I Finding Balance…. I can usually recognize my levels of hunger and fullness. I try to eat when I am hungry and stop when I am comfortably full (not stuffed). I generally try to eat slowly enough to notice tastes, textures, temperatures, and flavors. I savor my food as I chew and swallow it in a mindful manner and moderate pace. I don’t have a list of rigid rules about how I should eat. Instead, I follow general guidelines to support good health. When eating around others, I don’t play food games or push food around my plate. When eating with others, I generally don’t insist on special ways for my food to be prepared, or skip it altogether because I don’t want to eat what’s available. If I feel I’ve eaten too much, I don’t try to make up for it by skipping future meals, over exercising, throwing up, taking diuretics, or abusing laxatives. I usually eat three balanced meals a day, including fruits, vegetables, and whole grains, with healthful snacks as needed to satisfy my hunger (or multiple smaller meals). I avoid crash diets and diet products. I am not a slave to counting calories, carbs or fat grams. I strive to eat a variety of healthful foods most (about 90%) of the time, but enjoy occasional “play foods” or treats in moderation. I rarely skip a meal in order to consume empty calories such as candy, chips or desserts. I don’t drink alcohol in place of eating meals. I am not afraid to eat foods that are not “pure”, “raw,” or organic. (For vegetarians) I make sure I get an adequate amount of protein every day from a variety of sources. I do not use food to soothe or numb my feelings. I do not use eating and/or not eating as a form of punishment to myself or others. I do not reward myself with food. When I’m bored, I don’t turn to eating for entertainment. 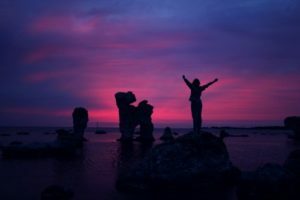 Rather than using food as a distraction from my feelings (eating either too much or too little), I have found healthier ways to deal with them. I do not restrict my intake in order to feel in control when life gets stressful. I eat because my body needs sustenance, and also because it is enjoyable. … in how WELL I’m eating? Overall, my eating patterns and food choices are supporting good health. My daily intake includes a variety of foods, including protein, carbs and healthy fats. I meet my body’s requirements for fuel each day. I may sometimes eat a little too much, but not more than two or three times a week, and I don’t become overly stressed about it. I have energy and am not often fatigued. I am sleeping well, and am not afraid to eat something before bed if I’m hungry. Friends and family have not expressed concern about my weight and eating patterns. My doctor does not express concern about how much/what I am eating. …in how I FEEL about eating? I believe I deserve to eat any food in moderation—guilt-free—without having to earn the right to eat it. When eating around others, I generally don’t worry too much about what they think of my choices. If I eat normally, I trust my body not to gain too much weight. Thoughts about food and meal planning do not consume my day. I do not feel out of control while eating. I feel that eating well is an important and necessary part of my overall health and well being. Rather than feeling anxious or guilty, I usually enjoy eating. Whew – that was a lot of ground to cover. Again, the goal here is not perfection, but to gradually move toward being able to meet the goals above. Want to see how you’re doing in all of these areas? Take the free Eating Issues Tests from Finding Balance. 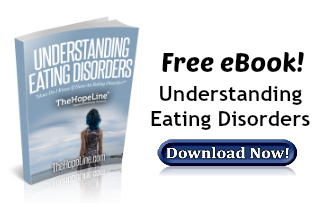 For more information download our free eBook Understanding Eating Disorders.